The Middletown Insider: Roots in Ripon - He Won’t Fight! Roots in Ripon - He Won’t Fight! Recently, I wrote an article about General Robert E. Lee, commanding officer of the Confederate Army during our American Civil War. Lee very nearly pulled off the upset of American history by outmaneuvering the apparently hapless Union generals called upon by President Abraham Lincoln to carry the fight to the outnumbered Southern forces. By most historical accounts, the Civil War should have been over in a matter of months, not the four long years and 700 thousand deaths it extolled from a war-weary nation. My sister Joy, came over for Thanksgiving last month, bringing me a couple of magazines she ran across that she knew I would treasure. As a Civil War buff, I have accumulated over the years a small library of books, magazines and other items pertaining to this horrific war. The two magazines Joy acquired for me are both copies of The Civil War Times: one dated August 1968, and the other August 1962. A section in the 1962 edition focused on the centennial edition of the Battle of Antietam. The summer months of 1862 are considered the high summer of the Confederacy. Never again would the cause of the South and her fight for independence come as close to success as it did under the leadership of Lee, Stonewall Jackson, Jeb Stuart, and other notable Southern generals. Second, the Union general selected to head the Army of the Potomac (later to be called the Union army) was not willing to fight. General George B. McClellan, like his counterpart of the Confederate army, General Robert E. Lee, was second in his class at West Point. And like Lee, McClellan was a military engineer. He never commanded troops in the field against an enemy until the Civil War. And this was his undoing. 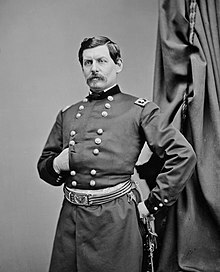 McClellan was viewed as an up-and-comer as a military officer, serving successfully in every command during his eleven years of service. During his time in the army, he used his fluency in French to publish a manual on bayonet tactics that he had translated from the original French. He also wrote a manual on cavalry tactics based upon Russian cavalry regulations. The Army also adopted McClellan’s design for a cavalry saddle, known as the McClellan Saddle. It became standard issue for as long as the Army had a cavalry, and is still used today in ceremonial events. Little Mac resigned his commission from the Army in 1857. He was married to Mary Ellen Marcy in New York City in 1860. During this time, he was the chief engineer and vice president of the Illinois Central Railroad, and then president of the Ohio and Mississippi Railroad. Civilian life simply did not suit him. He continued to study battlefield tactics which bolstered his adeptness at training and preparing soldiers for combat when he rejoined the Army. Prior to the outbreak of the Civil War, McClellan decided to try his hand at politics. He supported the Democrat Party’s presidential candidate, Stephen A. Douglas in the 1860 election. Later, he would run for president as a Democrat in 1864, in hopes of defeating President Lincoln. He re-entered the Army in the spring of 1861. Oddly enough, McClellan did not come from the abolitionist point of view, as did many of his fellow officers in the Union Army. He believed the South should be allowed to practice slavery if that was their choice. He was vehemently opposed to federal interference in slavery. But he was just as opposed to states seceding from the Union. But his unwillingness to commit troops in the field, always believing that Lee had superior numbers, caused him to be viewed as an inept battlefield commander. Sadly, he spent the remainder of his life attempting to rewrite his legacy. He died in 1885. General George B. McClellan simply did not have the heart of a warrior. And that cost the lives of countless men, both for the North and the South.